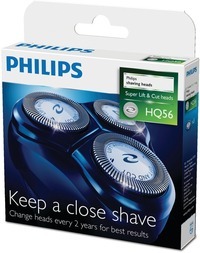 This Philips replacement part is compatible with a large number of the older Philips series of electric shaver, although Philips have stopped producing the HQ4, HQ4+ and HQ5 and HQ55 any model that requires those parts will find the HQ56 is the perfect replacement that will fit correctly in the head frame and work as well as the original parts. Excellent service and a quality product delivered promptly. Excellent product. Although reasonably expensive does save the cost of buying a new shaver. Much cheaper buying online than from a store. I have used Philips razors for years but find that replacement cutters are very expensive. Sometimes it is more economical to buy a new razor - when it is on offer - than just blades. My husband was absolutely delighted to receive the spares the very next day after I ordered them online. First class service thank you. An excellent product, and an excellent service from Shaver Spares.co.uk. I ordered on monday, the replacement shaver head arrived tuesday. The price was very good also. I would reccomend using Shaver Spares.co.uk company to anyone. AS this is a genuine Philishave product, it is what it is. It does the job, as did the original ones, but they will, like the others, go blunt with time. The replacement heads arrived in under 24 hours with free p & p and were well packaged. They fitted perfectly into an old Philishave thanks to the information on the website. Very pleased all round as the price was excellent and what a service. replacement blades for electric shaver. I found these blades to be of excellent quality and they made such a difference to my shave. I would certainly recommend them to anyone needing replacement blades. The first time I have had dealings with this company and it definitely won't be the last. A very professional and satisfactory service. Placed order friday morning it arrived on saterday morning.Excellent service product and price. The item arrived in the lunch-time post the following day. I only ordered it online the previous afternoon. Who said living in the rural south-west was a no-no! First class service indeed. Shaver heads arrived very quickly and were good quality. Thank you Shaver Spares. Whole transaction was a pleasure. Clear identification of product required, easy to order on the web and swift delivery. Excellent service. The shaver heads arrived next day.